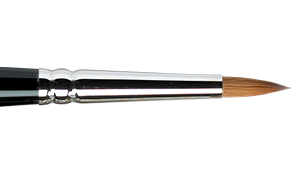 More than any other tool, the brush is a direct and fluid extension of the artists' hand, eye and expressive vision. This principle has driven Winsor & Newton to hone their brushmaking process to create the finest artists brushes, and with over 150 years of experience they have earned the reputation for making the world's finest from the very best raw materials. Their dedication to perfection led Queen Victoria herself to give orders that Winsor & Newton, holders of the Royal Warrant, be commanded to produce the very finest watercolour brushes in her favourite size; the No. 7. This resulted in the Series 7 range that we know and love today. Since its inception in 1866, the standards of quality have remained consistently high for the Series 7 brush - although there has been a move away from the original ivory handles and sterling silver ferrules made for Her Majesty Queen Victoria! 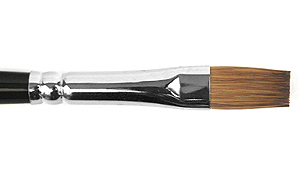 Customers in the USA should note that there were changes made to CITES permits in May 2013, which has limited the size of Kolinsky sable brushes we can currently ship to the United States to up to a size 4. Follow the link to find out more about the Series 7 shipping restrictions to the USA. Size 11 and 12 brushes come with a wooden presentation box. Hair is shorter out of the ferrule to aid fine detail and delicate work. 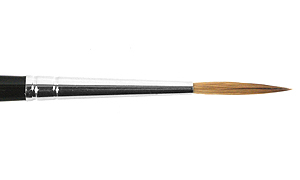 The term 'Kolinsky' is sometimes used quite generally to refer to sable brushes, so it can sometimes be hard to distinguish the best quality sables from standard sables, as the term has become a common description for more ordinary brushes. Series 7 brushes are set apart from their competitors because Winsor & Newton only use the pure Kolinsky hair sourced from Siberian Kolinsky - Mustela Sibirica Siberica, and it is the way that this hair is treated and prepared that really sets the standard of the Series 7 brush. True Kolinsky is exceptionally robust and strong as a result of the consistently low temperatures in its native eastern Siberia. The properties of this extraordinary hair, and the care and skill that the brushes are treated with when they are made make the Series 7 the pinnacle of quality. Each individual hair filament is made of tiny scales which in nature would keep the animal warm in the extreme Siberian winters. The scales increae the surface area of the hair, trapping any moisture. This large surface area is particularly beneficial with regards to watercolour painting; when bundled together in the brush head the scales draw up copious amounts of water and paint, which results in the great 'carrying capacity' unique to Sable hair. Rather than relying on a supplier to select suitable Kolinsky hair, Winsor & Newton hand select and prepare the hair at their own English brush factory. The factory is located in Lowestoft, which was chosen as it is a traditional fishing village. Generatons of individuals have grown up in the industry, an industry which requires good dexterity especially when fixing fishing nets - these unique skills meant the individuals could work to the exacting demands required to hand make brushes. Experience is the key to transforming a brush maker into an expert. Most of the Winsor & Newton brush making workforce spend their working lives at the factory; in fact in the last 60 years the three people in charge of Series 7 have a combined 134 years experience! The brush making process has remained relatively unchanged for well over 100 years. Each process is carried out by hand in the gentlest possible manner to ensure that the hair is not damaged. The Series 7 brush makers are required to have many years of experience of brush making before making the very best brush. Read below to learn how the 'taper-dressed' hair and hand-rolled dome results in the signature elongated tip and the wide belly of the Series 7. To begin making a Series 7 sable the finest hair available must be selected. The Winsor & Newton hair selection technique is perhaps the most rigorous around. Before work begins the strongest hair with the most spring is selected, the best quality hair is then thoroughly cleaned without the use of chemicals or detergents. This cleaning is achieved through a series of processes, including tumbling the hair. Again the hair is graded for good spring. Hair with the best spring is selected as their strong filaments control the brush head and ensure that a point continually reforms. Any blunt or broken hairs are also removed at this stage. Combing then takes place and 'Dressers' separate the hairs into groups depending on their lengths. The hair is cleaned again, then straightened and rested to ensure it retains both its spring and point. This process is repeated until the different lengths of hair are clearly put into defined groups. One brush can have as many as 7 different lengths of hair depending on it's size. Known as 'taper-dressing' , this process is the culmination of Winsor & Newton's unique hair preparation. Each mixture of hair is wrapped in a small, acid-free paper packet ready for use by the brush maker. The brush maker first selects the right amount of hair for the brush size that they are making. The small bundles of hair are tied using a piece of linen thread, and the tuft is gently twisted and rolled between the fingers with great skill to form the perfect 'domed' shape. The perfect dome shape is absolutely critical as it determines the performance of the brush. If it is too flat or rounded then the brush may not point properly. Other sable brushes are usually 'solid' dressed, which means that the hairs used are all of the same size. This results in a stubbier tip with less control and accuracy during painting. After this process the brush head is fitted into the seamless nickle ferrule and glued into place. Once a Series 7 brush has been assembled it is inspected again for blunts, which is a long process all done by hand. Each hair is inspected under a magnifying glass. Only a brush made using the most perfect, unbroken hair will show the finest tip when splayed and held to the light. Once the hair has been assessed a brush handle is then crimped into place. The 'Wet Point' test is the final quality test and is undertaken by the most experienced brush maker. Every Series 7 brush is carefully tested by hand in water on watercolour paper to ensure that it holds and retains an excellent point and shape when it use. This testing takes time and expertise, but it is the only way to ensure the performance of these exceptionally high quality brushes. After 'Wet Testing' has taken place the brush is lightly gummed and a brush head protector is applied to protect the brush during transit. For larger sizes a tag is placed in the box with the brush, indicating the name of the brush maker. The brush is then packed away ready for sale. The Series 7 brush making process requires generations of skill, a thorough understanding of which hairs have been proven to provide the greatest expressive control and an exacting and uncompromising eye in selecting the finest materials. Winsor & Newton's unique brush making process ensures that each brush measures up to their rigorous standards. Use a jar of clean water to test your brush or reshape it. You should dip the brush in and swirl it around to ensure that it is thoroughly wet. 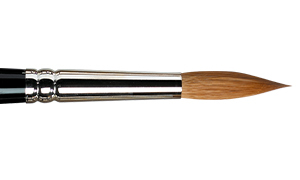 With larger brushes you may need to spend longer on this process to ensure that the brush is wet to the very centre. Dip the brush again and drain off a little of the water using the rim of the jar. Ensuring that you are away from furniture and carpets give the brush head a hard flick against your wrist. The brush should now form a point. When you have mixed your colour and drained any excess back into your palette, twist your brush head gently to get the perfect point. You may have to drain more colour from the tuft with larger brush sizes. Applying washes with a Series 7 brush is easy as the large belly of the brush holds more colour than a standard sable brush. A No. 10 Series 7 can complete a whole skyscape on a full size imperial sheet (30" x 22") with one brush load of colour! The amazing holding capacity of a Series 7 is made all the more marvellous when you consider that they also form such a fine point. Similarly fine lines can be achieved with any brush in the range, regardless of its size; the reason for choosing a larger brush over a smaller would be if you wanted a large reservoir of colour. If you are picking out your first Series 7 brush, we would recommend around a size 5. This size will give you a good colour carrying capacity and will achieve a very fine point. A good trio of brushes to start with would be sizes 3, 5 and 8. These three brushes will give you the ability to create a good spread of different sized washes and as fine a point as you will need. Once you have used a size 8, then you will definitely appreciate a size 9 or 10, especially if you regularly paint in large washes. Brilliant large wet-in-wet washes can be acheived by using two size 10s'. Having two larger to brushes to hand means that there is no need to wash the brush in between applying the colour so you can create big washes quicker and with more control. The miniature size of the brush head allows for a more angled 'pen'-like position of holding, which is required when working on very small works. A Series 7 brush can last a lifetime, providing it is cared for correctly. Correct care will invlolve gentle, yet thorough washing and drying after use and avoiding exposure to strong sunglight or moths. If the brush is used constantly, this will obviously have an impact on its working life. Even so, because the point is so tapered, a worn Series 7 will still out-perform many 'solid-dressed' brushes. You can read our cleaning and care instructions here. Series 7 brushes can also be used with Oils and Acrylics, but, due to the nature of the paint, they are likely to wear much more quickly. This is especially the case if they are used on a coarse surface. As is always the case with brushes, it is paramount that they are cared for and cleaned correctly. We do have a handy page with cleaning and care instructions for watercolour brushes if you have any questions. Following these cleaning proceedures will extend your brush's useable life!